What has changed for Greek women since the crisis? Greek women gradually attained equality before the law over the course of the 20th century. Traditional gender roles have changed, but old habits die hard and feminists still have to speak out against everyday discrimination and advocate for lasting reforms. Margarita Tsomou, editor of the German pop-feminist Missy Magazine, recaps past achievements and present-day conflicts. Greek women have been fighting for their rights ever since 1887, when Kalliroi Parren started up Εφημερίς των Κυριών (“The Ladies’ Journal”), the first magazine for women’s rights in Greece. Parren’s demand for female suffrage was finally granted in 1956, and the first women were elected to public office that very year. Then in 1975, after seven years of military dictatorship, the principle of equality between men and women was enshrined in the Greek constitution. The 1980s saw the passage of abortion legislation that still ranks among the most liberal in Europe. 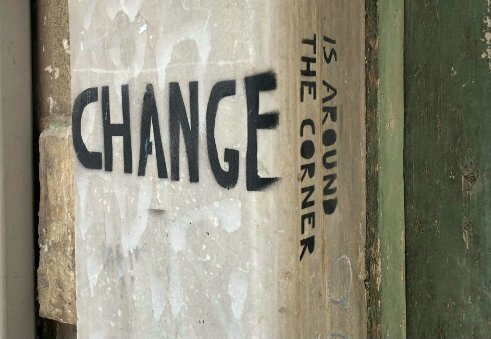 So there is a relatively solid legal foundation for gender equality in Greece, but that has not rendered feminist engagement obsolete: especially lately, a growing number of feminist initiatives and LGBTQI groups are chipping away at sexist gender models and patriarchal structures in Greek society. The economic situation of women in Greek society is roughly on a par with that of women in other parts of Europe. According to Eurostat figures, the gender pay gap in Greece comes to 15%, which is actually a little smaller than the European average. Female employment has increased substantially since the 1990s: according to the World Bank, the proportion of women among the gainfully employed has grown from 36.1% in 1990 to 43% today. According to the latest study by the European Union Agency for Fundamental Rights (FRA), the incidence of violence against women is relatively low in Greece. The report points out, however, that this figure only represents the number of reported assaults. So it says less about the actual incidence of violence than about women’s willingness to report it. In 2009, in order to bring this issue to the public’s attention and provide help and counselling to assault victims, the Greek General Secretariat for Gender Equality launched a nationwide programme to prevent and combat violence against women. It set up a hotline, 40 counselling centres and 21 shelters for women, and trained nurses and police personnel in dealing with assault victims. 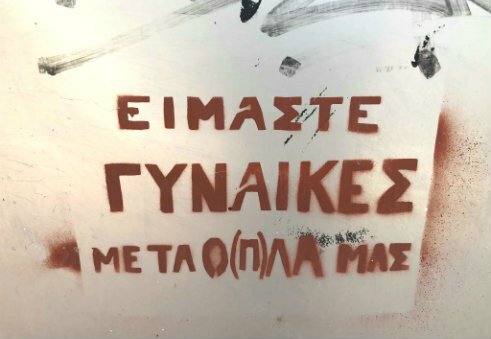 Graffiti in central Athens: “We’re women with everything that entails (and with our weapons)” | © Goethe-Institut Athens/Philine Siantis Greece has also made gradual progress in its legal system. A law against domestic violence was passed in 2006. And in early 2018 – around the same time as in Germany – the Council of Europe’s 2011 Istanbul Convention to prevent and combat violence against women was ratified by Greek parliament and adopted as a binding legal standard. Most of the milestones in progress towards legal equality in Greece were achieved in the 1980s. Among other things, the new social-democratic government (PASOK) at the time introduced the right of divorce and civil marriage, outlawed discrimination against women in the job market and abolished the widespread custom of dowry. The family of a bride was previously required by law to transfer land, houses, livestock or other property to the groom, which, in the eyes of traditional society, served to offset the burden on the groom’s family of supporting his wife. The abolition of the dowry requirement was crucial to feminists, liberating women from economic dependence on their own families and their husbands. Greek abortion laws are among the most liberal in Europe. Abortion is legal during the first twelve weeks of pregnancy, and can usually be performed in any public hospital without mandatory counselling (unlike in Germany) or any extra fees. Gender equality in Greece has increasingly been a subject of debate in recent years, in the wake of the Eurozone crisis. Many feminists, including the bloggers of the website tomov.gr, argue that, all things considered, women were the first to be hit by the crisis. Due to job losses in the social services, e.g. caring for children, the sick and the elderly, the burden of care reverted to the women of the family. But that doesn’t mean the crisis has driven the female half of Greek society back into the kitchen, according to the feminist group Kammena Soutien (“Burnt Bras”). As men tended to have steadier jobs than women before the crisis, in keeping with traditional gender roles – to which many Greeks still adhere –, they bore the brunt of the latest job cuts. Women, on other hand, tend to work in low-pay sectors, which have actually grown since the crisis. As a result, because more women than men have precarious jobs, on the whole female unemployment has increased less drastically. So, according to Kammena Soutien, working women are often now the breadwinners for fathers, sons and husbands who’ve lost their jobs. Plenty of men now have to do the housework and look after the kids. So the crisis might not have had only a negative impact on the social standing of women. And the consequences of austerity policy and the Eurozone crisis may lead to further shifts in traditional gender roles. The social upheavals in Greece since the outbreak of the crisis are also reflected in the increasing number of new feminist groups challenging a patriarchal culture that stubbornly persists, despite the constitutional enshrinement of the principle of equality. Marriage is still the predominant form of partnership in Greece owing to the enduring clout of the church and a traditionally Christian conception of family. Apartment-sharing and having children out of wedlock are still considered unusual to this day, especially in rural areas. And married women are still conventionally expected to assume primary responsibility for childrearing and the household. Women still play too small a role in the media and the public realm: it is not unusual for discussion panels, for example, to be made up entirely of men. A great deal work still needs to be done in sensitizing Greek-speakers to sexism in the language as well, according to the queer.gr bloggers: gender-neutral forms are seldom used, while most of the terms for homosexual or transsexual are still used as pejorative epithets. Since late 2016, feminist and LGBT groups such as Brastards, Beflona and queertrans have been holding feminist demonstrations to raise public awareness of issues like sexism and homophobia in everyday life. In other words, Greece has an active civil society that is persistently speaking out for an end to misogynist behaviours and habits – because laws are not enough to overcome everyday sexism in Greece or anywhere else. Margarita Tsomou is editor of the "Missy Magazine"
Copyright: Text: Goethe-Institut Athens, Margarita Tsomou. This work is licensed under a Creative Commons Namensnennung – Keine Bearbeitungen 3.0 Deutschland license.